Exciting excursions for both young and old! Whether you’re planning a tour through the Ore Mountains, or are travelling to Dresden or Leipzig, it is definitely worthwhile. But an excursion to the Czech municipality of Karlsbad, which is incidentally one of the most famous spa locations in the world and is steeped in history, is worth a short trip. If you also fancy going walking or hiking there are almost 500 km of hiking trails in the Ore Mountains, and around 300 km in the beautiful Vogtland. Books, magazines, board games and cards are available in the “Stübchen” (small lounge). You can relax in the sauna and in the steam room and enjoy refreshments at the tea buffet between individual trips to the sauna. Have we aroused your interest? A thrilling rush, dynamism and a lot of fun: in the “POWERhall” opposite the hotel, teams playing various sports can face off against one another – perfect as a corporate event, a stag party or simply because it’s great fun. 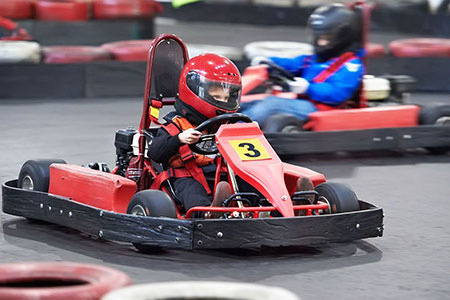 Kart racing on the re-designed kart track, two bowling lanes, football on the artificial grass in the indoor soccer hall. We also recommend that sporty guests try out the neighbouring sports bar, located 300 m away and offering bowling, skittles, darts and pool. Have we aroused your interest?